Historical Tapestry: C.C. Humphreys on Why I Love Swashbuckling! C.C. Humphreys on Why I Love Swashbuckling! They say I was born with a sword in my hand – which must have been uncomfortable for my mother. While that may be only family myth, what is true is that as soon as I could wield one. I did. There are photos of me in full Zorro garb, aged three. I was briefly distracted by cap guns from 7-10. But the sword soon reclaimed me. It wasn’t only the weapons, of course. It was those who wielded them. Errol Flynn, speaking treason “Fluently,” he said, fighting Basil Rathbone in the castle as Robin Hood. Tyrone Power as my first hero, Zorro, duelling the same opponent (Rathbone was an excellent swordsman). Slicing the candles without putting out their flame. And many since – can we ever forget Inigo and Wesley in ‘Princess Bride’? Bliss! At 13, at my public school, I got to more than fantasize. I became a fencer. I trained in foil and epee – but sabre was my true love! It was just more flamboyant, the slashing attacks, the long leaps called fleche. I became school champion at the weapon, a semi finalist in London Schoolboys at 16. I based my decision to become an actor largely on the opportunities it provided to leap about with bladed weaponry. Trained in stage combat at drama school in London then managed to get a variety of weapons into my hands over my career. I was a gladiator in the Biblical-Roman epic mini series ‘Anno Domini,’ in the 80’s. Sir Miles Thackeray in ‘Zorro’ – if I was not him, at least I got to fight him, and in Madrid no less! I was assorted Cardinal’s guardsmen at the Bristol Old Vic in ‘Three Musketeers’ – again, if I wasn’t D’Artagnan, at least I got killed by him! Years later, in Canada, I became a fight choreographer in theatre. It was inevitable that when I became a novelist I would choose characters who loved their swords. Jean Rombaud in ‘The French Executioner’. My latest, ‘Shakespeare’s Rebel’ about the Bard’s own fight arranger. And, of course, my boy Jack! Jack Absolute! 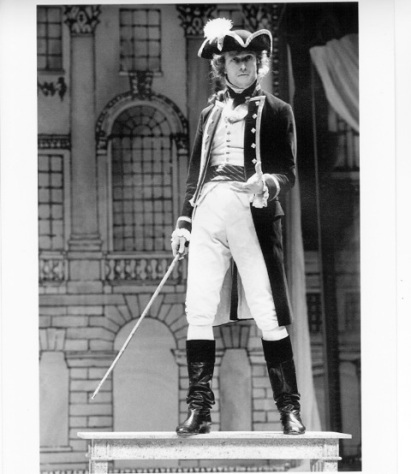 I played him on stage, in Sheridan’s ‘The Rivals’ at Oxford, in 1987. Choreographed a small sword for him, loved being him - so years later stole the character for a series of novels. ‘He’s your fantasy alter ego,’ my wife says. True and since the old bones don’t let me leap about so much, he’s a pretty good substitute. Except I am leaping about with a sword, at least one more time – at the book launch for ‘Rebel’ in Vancouver, Canada, this July. And I am going to do a genuine ‘swashbuckle’. Not many people get to see that these days. You need a small round shield – the buckler. And you need a broadsword. You ‘swash’ the sword – strike it vigorously – against the buckler. It sounds like a bell and it summons your enemies to the duel. Can’t wait because… I love swashbuckling! Jack Absolute: A Novel (ISBN: 9781402280702; MAY 2013; $24.99 U.S.; Hardcover; Fiction)– reimagined as the title character in C.C. Humphreys’ first novel in a three-book series set during the American Revolution. Humphreys has long had a love affair with the character of Jack Absolute. The actor played the dashing leading man in a British tour of The Rivals early in his career, and decided to bring him from the stage to the page when he began writing novels. A bit about the book…It’s 1777 when Captain Jack Absolute becomes a sensation throughout London. This news comes as a shock to the real Jack Absolute when he arrives in England after four months at sea. But there’s little time for outrage before he finds himself dueling for his life. Right when he thinks he’s finally won, he is forced to flee London by the quickest means possible, becoming a spy in the American Revolution. 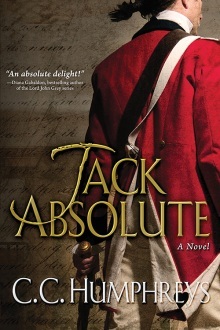 From the streets of London, to the pivotal battle of Saratoga, to a hunt for a double agent in Philadelphia, Jack Absolute marks the exhilarating beginning of an epic historical series and a character you won’t soon forget. C.C. Humphreys is a novelist, fight choreographer, and actor who played Jack Absolute in The Rivals for a six-month run in London in the mid-1980s. When he became a full-time writer a decade ago, he decided to transform his leading man into a title character. Humphreys has written seven historical fiction novels including The French Executioner, which was runner-up for the CWA Steel Dagger for Thrillers 2002. The Jack Absolute series will feature three books: Jack Absolute, The Blooding of Jack Absolute, and Absolute Honour. I just finished this one (reviewed it today) and I adored it -- such fun -- the sword work in the book is pretty amazing -- and now I know why!